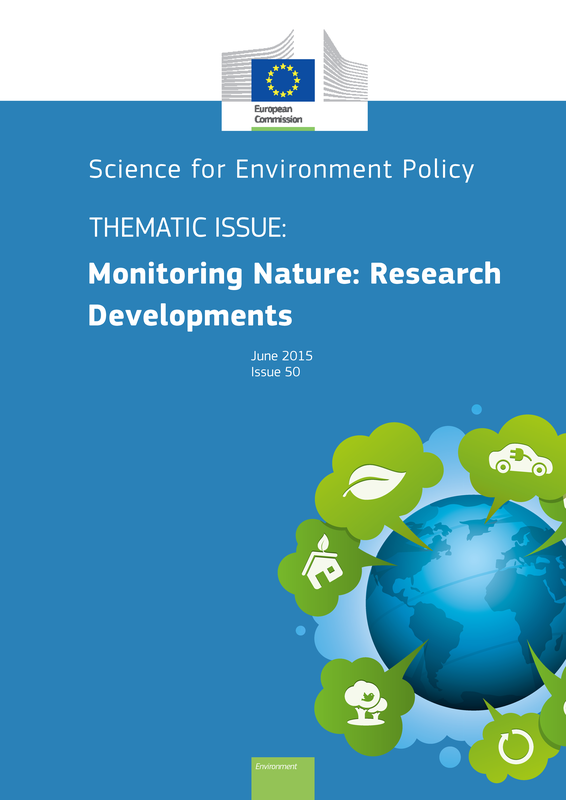 This month the European Commission Science for Environment Policy magazine focuses on research developments in monitoring nature. It includes a research from around the globe, including some of my research from Australia on how to ensure monitoring delivers effective, evidence-based conservation. 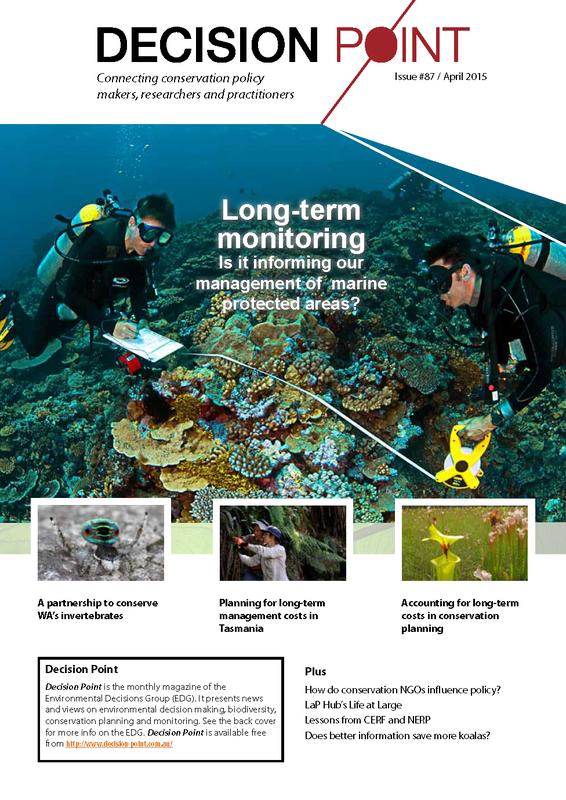 Long-term monitoring: is it informing our management of marine protected areas? 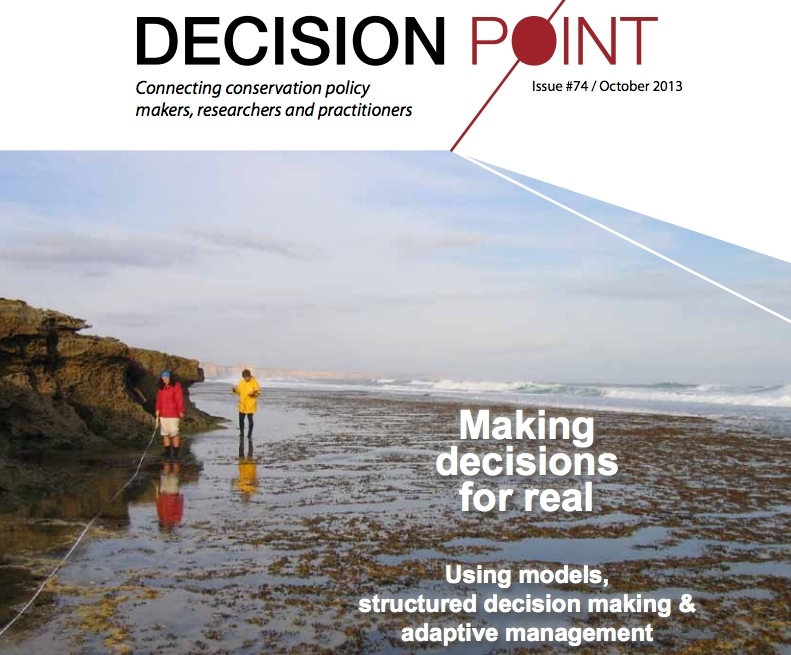 See the latest issue of Decision Point for a piece by Carly Cook and I on why we should be proud of the long-term monitoring we do in our Australian marine protected areas. We point to some current limitations, and some ways forward to improve the use of long-term monitoring data in conservation management. I’m pleased to announce that the monitoring, evaluation and reporting symposium will be running at the Australian Marine Sciences Association conference in July this year. This symposium is shaping up to be a great forum to share innovative ideas to progress current approaches to monitoring, evaluation and reporting on the health of the marine environment. Abigail McQuatters-Gollop will be giving an keynote presentation on lessons learnt from the implementation of the latest marine conservation initiative in the European Union – the Marine Strategy Framework Directive. We also have a range of presentations that have been proposed by Australian marine scientists from government agencies, universities and NGOs. We are now seeking presenters to submit abstracts in order to share their research, management approaches, or innovative ideas for monitoring, evaluation and reporting of the marine environment. We welcome abstracts for either oral presentations or presentation electronic posters (PEPs) to contribute to this symposium. Abstracts are due on Friday 17th April. Please submit your abstract here: http://www.amsaconference.net/presentations/abstracts/. We ask that presenters focus on sharing current, new or upcoming ideas that are changing MER in the marine environment to support clear and defensible evidence-based management. Please feel free to contact myself, David Collins or Steffan Howe (contact details below) if you’d like to discuss a potential contribution to this symposium. Below is an outline of the symposium for your information. I look forward to seeing your abstracts roll in through the online system soon! Symposium overview: Many organisations have the same aim for, but different approaches to, monitoring, evaluation and reporting on Australia’s marine environment. Many organisations also continue to grapple with scientific issues relating to monitoring and evaluating the marine environment and reporting to different audiences. With increasing pressure for organisations to report on the effectiveness of environmental programs and contribute to state-wide and national environmental assessments, it is vital that marine practitioners share their innovative research and ideas in order to progress a national approach to monitoring, evaluation and reporting. This symposium will provide a national forum to share innovative research that can help progress approaches to monitoring, evaluation and reporting of marine environmental programs. We welcome presentation and e-poster proposals relating to monitoring (e.g., advances in marine monitoring, and indicator development), evaluation (e.g., developing data standards for online databases, setting condition categories, and decision thresholds), and reporting (e.g., advances in report cards, improvements in information accessibly and novel communication strategies for public engagement). This symposium will involve presentations and a facilitated group discussion to share innovative ideas and develop avenues for future collaboration. The outcomes of the symposium will be published in the AMSA bulletin, and a manuscript on innovations in monitoring, evaluation and reporting on the marine environment. This symposium builds on sessions from previous AMSA conferences, which have dealt separately with monitoring, evaluation or reporting on the health of the marine environment. This symposium will be the first at an AMSA conference to bring all three interconnected elements together. Conveynors: Prue Addison (Australian Institute of Marine Science, prue.addison@gmail.com), David Collins (Environment Protection Authority Victoria, David.Collins@epa.vic.gov.au) and Steffan Howe (Parks Victoria, steffan.howe@parks.vic.gov.au). Please see the AMSA conference website for full details about all of the themes and symposia planned for the AMSA conference. Over 200 members of the general public attended the sold out event “Showcasing Victoria’s Marine Science” at Museum Victoria last week. This event aimed to showcase some of the most cutting edge research being conducted by Victorian marine scientists, and was hosted by the Australian Marine Sciences Association Victoria branch and Museum Victoria. Showcasing Victoria’s Marine Science event logo. Featuring underwater image by Dr Julian Finn, Museum Victoria. Dr Peter Macreadie, from the University of Technology Sydney, shared his bright ideas for blue carbon: “Reducing carbon emissions is an important approach to tackling climate change, but too frequently we forget that we have another weapon up our sleeves: ‘biosequestration’, which is the natural process of using plants, trees, and soils to capture and store carbon. We have recently discovered that coastal vegetated habitats – seagrasses, saltmarshes and mangroves – are among the most powerful carbon sink on the planet. They can bury carbon at a rate 40-times faster than forests and have the ability to keep buried carbon locked away for millennial time scales”. Dr Macreadie is working with scientists at Deakin University and their research has shown that human-induced changes in the coastal zone has caused a 100-fold weakening in the ability of coastal sediments to store carbon and thereby help mitigate climate change. It’s not all bad news though, Peter says that “Australia’s land is girt by sea and abounds in blue carbon sinks, which puts us in a prime position to capitalise on nature’s ability to help reset our planet’s thermostat”. Dr Alecia Bellgrove, from Deakin University in Warnambool, shared her research on seaweed superfoods: “Seaweed production via aquaculture has doubled in the past 10 years and now accounts for a total annual harvest of 23.8 million tonnes valued at over US$6 billion globally. There is currently no commercial aquaculture of Australian seaweeds, however we are receiving increasing interest from international importers for sources of high quality Australian Made seaweeds that are perceived as clean and pure, particularly in Asian markets”. Dr Bellgrove believes that the opportunity for a new, sustainable and vibrant Australian seaweed industry is dawning. Her research group have begun to explore the unique Australian marine flora for potential new edible seaweed products for both domestic and international markets. Their palatability tests and preliminary nutritional analyses suggest that Aussie seaweeds fair really well against existing commercial products. Dr Kate Charlton-Robb, from the Australian Marine Mammal Conservation Foundation, shared her dolphin discovery research: “In a time when we are losing species at an alarming rate, it is a rare event to discover a new species, let alone a dolphin that has been living right under our noses. The Burrunan dolphin, Tursiops australis, was formally described and named in 2011, and has two of the only known resident populations here in Victoria”. Dr Charlton-Robb explained the bitter-sweet experience of the excitement of discovering the Burrunan dolphin, whilst officially listing this dolphin as threatened. “With an effective population size of less than 100 dolphins in each of the Port Phillip Bay and Gippsland Lakes resident populations, there is considerable concerns around the conservation of this species” Kate said. Kate’s research team are currently conducting applied research to further protect the Burrunan dolphin, by incorporating population and distribution assessments, conservation genetics and identifying areas of significance for this iconic species. Our other three speakers shared their diverse and inspiring research stories with the general public: Tim Allen shared his perspective on the immense value of scientific research in Victorian marine conservation efforts; Dr Tim O’Hara inspired the audience about the amazing advances in deep sea biodiversity research at Museum Victoria; and, Associate Professor Jan Strugnell shared her southern ocean research that has revealed how dramatic ocean events of the past have left their legacy in the genes of an Antarctic octopus. 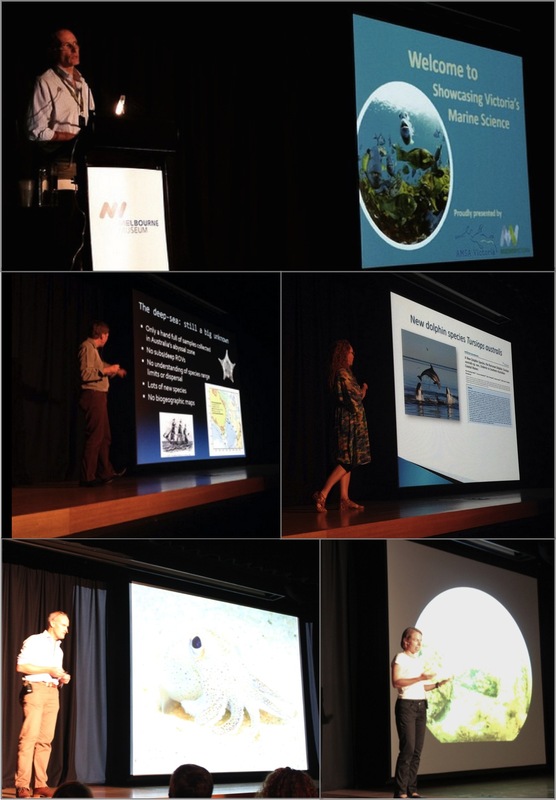 Our evening of marine science presentations: Dr Mark Norman (introducing our speakers), Dr Tim O’Hara, Dr Kate Charlton-Robb, Tim Allen, and Associate Professor Jan Strugnell. Image credits: Vera Gin (Museum Victoria) and Allyson O’Brien (AMSA Victoria). This event has shown that Victorian marine scientists are producing high impact scientific knowledge with great environmental and economic value, and the public interest shown in this event is testament to its enormous social value. Given the great success of this public event, AMSA Victoria are already planning another public event that will coincide with the national AMSA conference in Geelong this July. On Monday July 6th 2015, we will be hosting a Q&A style public event, where we will joined by a panel of leading Australian marine scientists who will discuss some of Australia’s major marine issues, and answer questions posed by the audience. From super trawlers to marine parks, it promises to be an evening of lively debate. So start thinking of some curly questions and keep an eye on our conference events webpage for more details. Long-term biological monitoring data are becoming increasingly available to inform conservation efforts internationally. These data are rich sources of scientific evidence that offer insights into the natural variability of ecosystems and species through time, as well revealing information about the effectiveness of conservation efforts. However, there are many occasions where long-term monitoring data, like other forms of scientific evidence, have been of little use to conservation. My colleagues and I recently explored how long-term biological monitoring data are used to inform Australian marine protected area (MPA) management. We focussed on long-term monitoring programs from Australian MPAs, as these are some of the world’s longest running monitoring programs, significantly contributing to the scientific understanding of the biological effects of MPA protection. These monitoring programs also represent rich data sources that are available to inform MPA management. We conducted interviews with MPA managers and scientists from Australian management agencies to document a national perspective of how long-term biological monitoring data are used to inform the evaluation and evidence-based management of Australian MPAs. This research generated a wealth of information is now available in our Journal of Environmental Management paper. 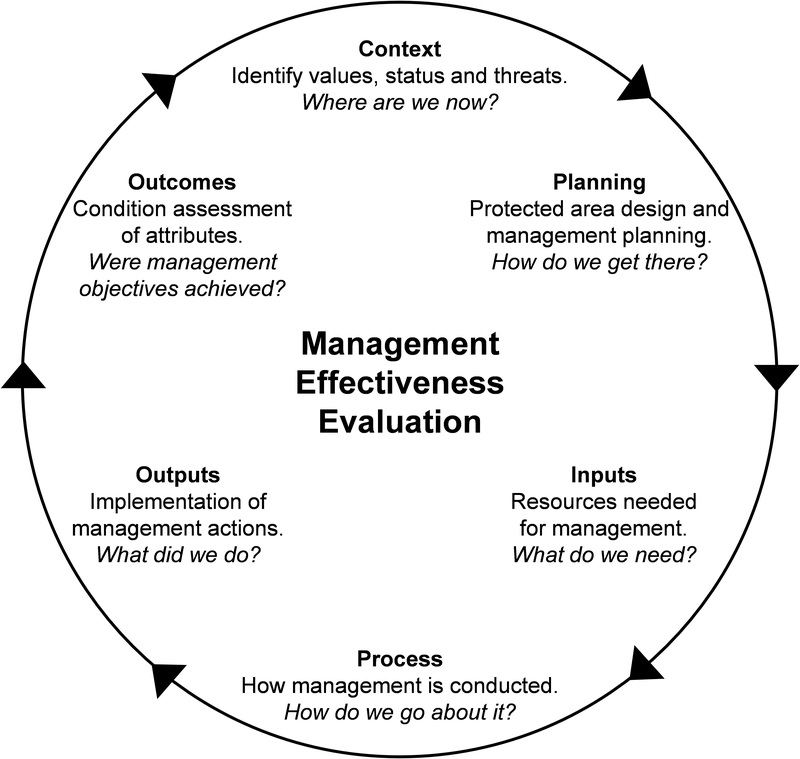 Like terrestrial and marine protected area management agencies around the globe, Australian MPA management agencies commonly use management effectiveness evaluation (MEE) to better understand, learn from and improve conservation efforts. MEE is being used to evaluate management effectiveness of many Australian MPAs, however this process is in its’ infancy with evaluation cycles only having occurred in most cases only a couple of times to date. Our research revealed that many long-term biological monitoring programs are used to inform qualitative condition assessments of biological indicators (under the “outcomes” stage of a MEE cycle), where most often published monitoring results are interpreted using expert judgment. That is, available quantitative biological monitoring data are not yet used in any formal quantitative condition assessments for MEE. We found substantial evidence that long-term monitoring data are informing the evidence-based management of MPAs – contrary to the common criticism that conservation management agencies fail to use scientific evidence to inform management. However, MEE is rarely the only mechanism that facilitates this knowledge transfer to management action. Ensuring internal MEE frameworks reflect MEE theory, to determine where breaks in the information chain may be preventing the use of monitoring data in evidence-based management. Implementing quantitative condition assessment of long-term monitoring data to ensure more objective, repeatable and transparent use of monitoring data in MEE. Increase the frequency of evaluation to ensure MEE enables evidence-based management. Invest in targeted long-term monitoring to support outcome assessments. I have been involved with researchers from the University of Melbourne in applying decision theory to a range of protected area management issues faced by Parks Victoria (the managers of Victoria’s terrestrial and marine Protected Areas). In particular we use structured decision making (SDM) to guide managers through a decision process. We believe SDM offers a platform to make more robust, transparent and defensible conservation decisions. As a part of my PhD research I have applied the principles of SDM and scenario planning to help Parks Victoria explore where to set management thresholds for biological indicators within Victoria’s Marine National Parks. My research is ongoing, but you can read more about it and our other SDM research projects in Decision Point. Conservation managers often have to make decisions in uncertain and complex situations. One way of dealing with this uncertainty is by modelling the different management alternatives on offer to see what type of results they might yield. The correct use of the appropriate model not only helps in making robust, transparent and defensible conservation decisions, it often generates insights on the nature of system being managed. There’s no question that when used well, models can deliver good outcomes. But despite their demonstrated benefits, models are often mis-used or not used at all to support conservation decisions. Instead, decisions are frequently based on intuition, personal experience or unaided expert opinion; and this can lead to biased decisions that rest on hidden assumptions and individual agendas. My colleagues and I recently investigated why models are still not used in many conservation decisions. We found a number of common objections to the use of models in environmental decision-making. In response to these common objections we suggested five practical solutions to help modellers improve the effectiveness and relevance of their work in conservation decision-making. Our practical solutions include: using a structured decision making (SDM) framework to guide good modeling practice (see Fig 1 for suggested modelling techniques that can be used within a SDM framework); improving the social process of decision-making by including stakeholders, experts and decision-makers in the modelling for decision-making; and, building trust and improving communication between modellers and decision-makers. 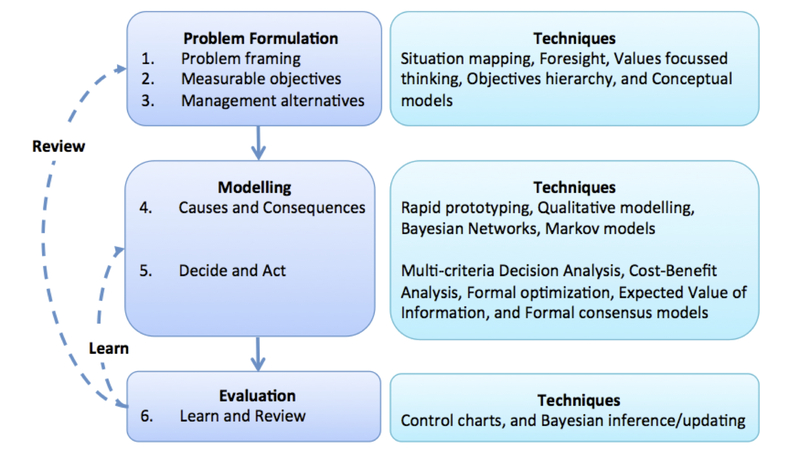 Figure 1: A Structured Decision Making/Adaptive Management framework with modelling techniques that can assist the decision-making process. Our practical solutions will challenge many modellers as they require skills outside of their core training and experience. However, if the aim is to achieve better conservation outcomes, then it’s definitely worth considering. You can read more about this research in our Diversity and Distributions paper or in this Decision Point article. 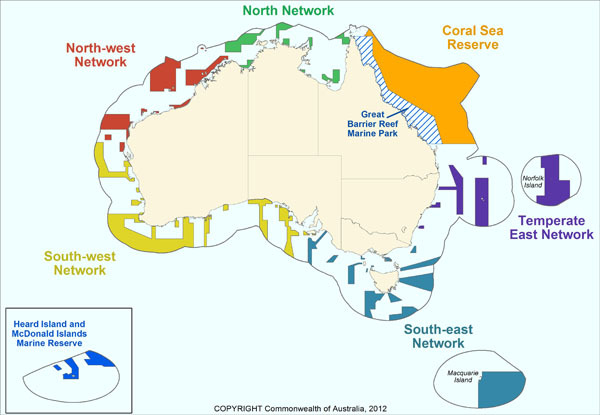 Will Australia’s new commonwealth marine protected areas work? The prominent marine scientist, Professor Bob Pressey has recently said what few marine scientists have been brave enough to say about Australia’s new commonwealth marine protected areas (MPAs): they won’t work. In November 2012, the Australian government established its latest round of commonwealth reserves, upping the area of Australia’s protected marine waters to an impressive 3.1 million sq km. As of the end of 2012, the NRSMPA now protects an impressive 3.1 million sq km of our marine environment. NRSMPA map: Commonwealth of Australia 2012. So why won’t Australia’s commonwealth MPAs work? Professor Pressey states clearly that the new commonwealth protected areas are in the wrong places. In fact, he refers to these as “residual” places which have been chosen as a political move: the declaration of impressively large areas of marine environment which are considered unsuitable for commercial uses (such as fishing and renewable energy generation). As these areas offer little commercial importance, they are essentially easier to allocate to marine conservation as there is the least opposition from industry. The primary goal for Australia’s MPAs is for marine biodiversity protection. The new commonwealth protected areas have been declared in remote, deep waters where there are few threats to marine biodiversity. Whilst nearshore waters close to our coastline continue to have a variety of human activities which threaten our marine biodiversity. The simple message here is that there should be more focus on declaring MPAs in nearshore waters where marine biodiversity is actually threatened. I’m a PhD student at the University of Melbourne. My research interests include marine ecology, conservation decision making, Marine Protected Area monitoring and management, and the science-policy interface.